The end of the 2017 Dakar Rally is just around the metaphorical corner. With Stage 11 completed, the toughest part of the rally is over. It took them 754km from San Juan to Rio Cuarto, with a competitive section measuring around 290km. The first 50km of Stage 11 were made up of sand dunes, after which it got faster with WRC-like tracks. 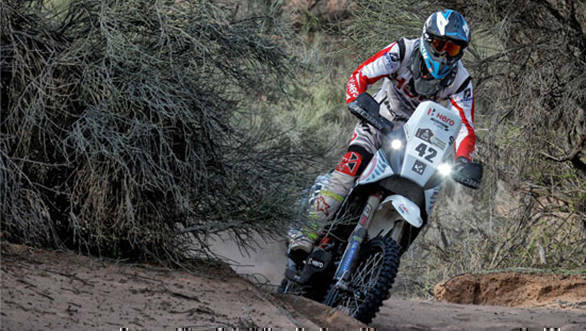 Joaquim Rodrigues of Hero MotoSports Team Rally managed to make his way back to 10th place after completing the stage in 14th place with a time of 3hr37m56s. According to him, the initial section through the dunes was very bumpy with a lot of hidden summits making it quite challenging. His team-mate, CS Santosh, started the stage in 37th place and found that although the stage was comparatively short, it was just as tough as the previous ones. The dunes were quite tricky, and the fesh-fesh (fine, loose sand) made overtaking other competitors quite tough. He finished the stage in 4hr28m34s to take 50th place. This pushed him down in the overall standings to 48th position.